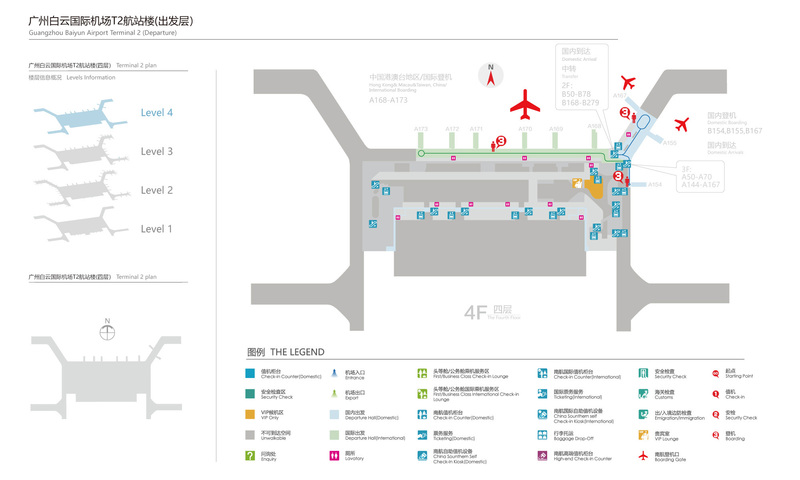 Located in the north of Guangzhou and at the junction of Renhe Town, Baiyun District and Huadong Town, Huadu District, Terminal 2 of the newly-built Guangzhou Baiyun International Airport is just 28km away from Haizhu Square in downtown Guangzhou. As one of the three biggest airline hubs in China, it is the country's first super-large airline hub developed and designed in accordance with international airline hub standards. It was reputed as one of "China’s Top Ten Construction & Science Achievements in 2005". As a new landmark in Guangzhou, it serves as a window displaying the city's new image and is a popular attraction among local Guangzhou citizens. 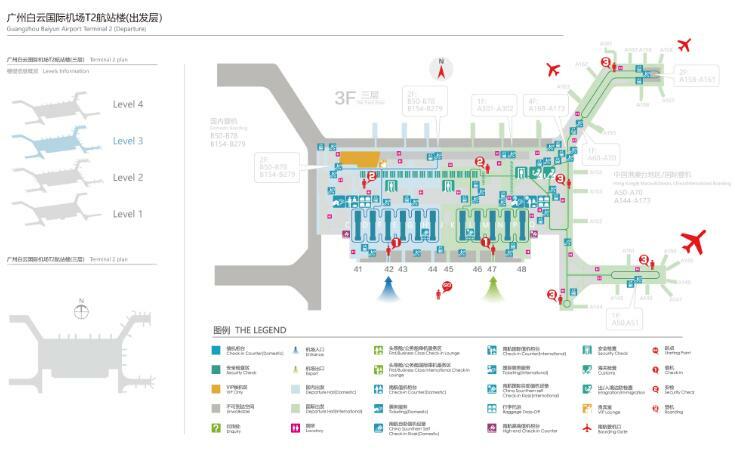 Domestic high-end check-in counters are distributed in Areas C and D of Terminal 2, and include first-class, business-class, Sky Pearl economy, Gold/Silver Card and SkyPriority. High-end check-in Duty Manager counters (C01, C02, D01, D02) . International high-end check-in counters are distributed in Areas Q of Terminal 2, and include first-class, business-class, Gold/Silver Card and SkyPriority. Domestic general check-in counters are mainly distributed in Areas E, F and G of Terminal 2, and include counters for general check-in, transfers, special services, flights where the connection time is too short, foreign airlines, overweight baggage fees, group check-in, reroutings, ticketing, and overweight baggage. Domestic check-in Duty Manager counters (E35 - 36/F01 - 02/H01 - 02). 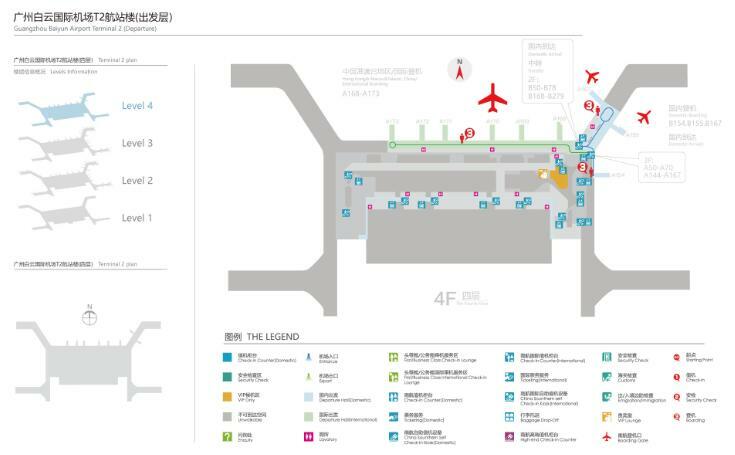 International check-in counters are distributed in Areas P, N and M of Terminal 2, where Areas P is for China Southern Airlines international flights (including Sky Pearl economy class), and some counters at Aisles N and M are used for flights of other airlines. Check-in Duty Manager counters (P1 - P2). Self check-in kiosks are available at Areas D, E, F, G, H and J of Terminal 2. Self check-in kiosks are available at Areas P, N, and L of Terminal 2.
a. Passengers for domestic flights with carry-on baggage larger than 20×40×55cm and weighing more than 5kg will be denied entry at security checkpoints and not be allowed to board (rules may differ from airline to airline). b. The overweight baggage fees counters are subject to change according to on-site adjustments. Scan your document at a self-service check-in kiosk to confirm flight information→Select baggage check-in and print the baggage tag→Attach the baggage tag to the baggage handle →Walk to the baggage drop-off point→Scan your document to confirm flight information→Lay the luggage on the conveyor belt flat with the handle outward →Weigh the luggage (weight and dimension limits: 20KG and 40x60x100cm)→Print the pickup slip when baggage is checked in successfully. Drop-off point: Outside the departures floor. Pick-up: Long-distance buses and buses to downtown are available on the west side of the first floor of the GTC, and tour buses and buses specially offered in the case of a flight delay are available on the east side of the first floor of the GTC. 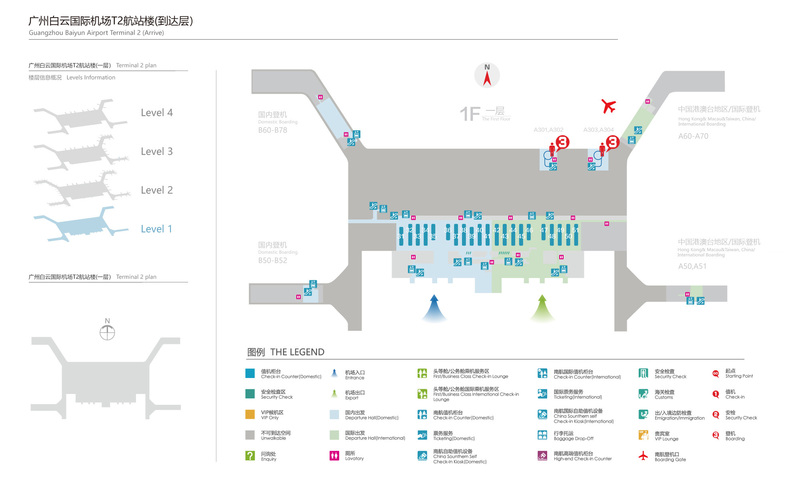 The "Airport North station" of the Guangzhou Metro is located in Terminal 2 on the west side of floor B1 of the GTC hall and has exits in both the GTC and the terminal. 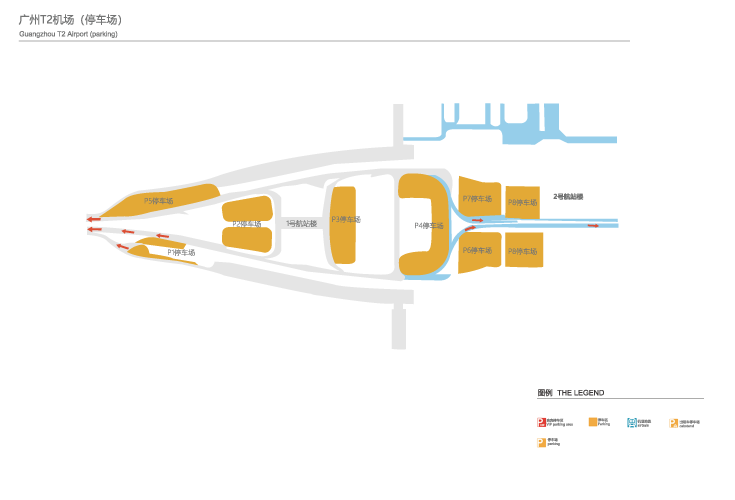 There is no area in Terminal 2 for car drivers to pick up passengers. 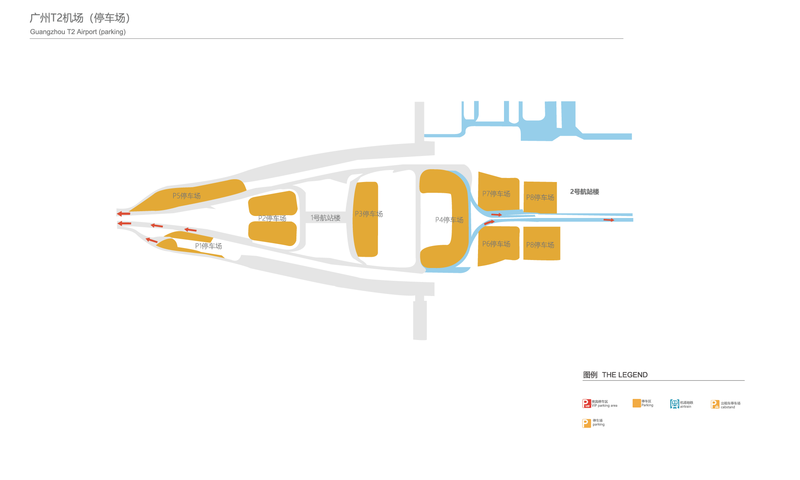 Car drivers who come to pick up passengers from Terminal 2 need to park in lots P6, P7 and P8, and arriving passengers can get to the parking lots after walking through the GTC. Route: Door 10 of T1 to Door 42 of T2 and back. Passengers can travel between Airport South station (Terminal 1) and Airport North station (Terminal 2) by metro for free during operating hours. 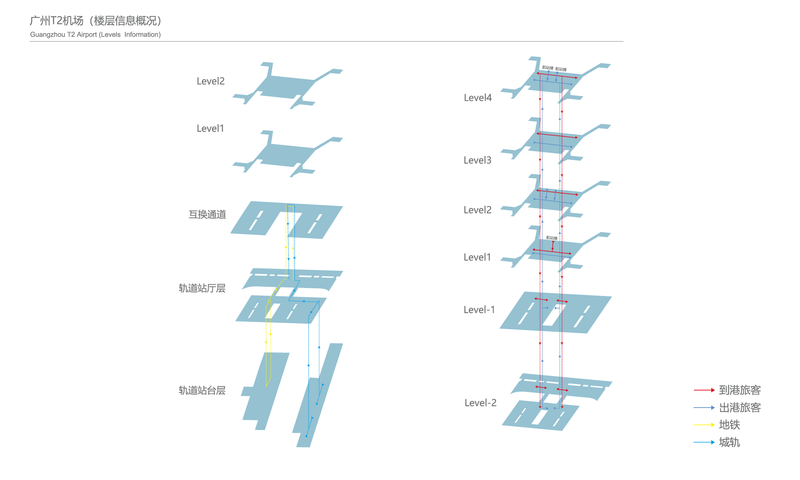 There are three newly built parking lots for T2, namely P6 (east parking lot), P7 (west parking lot) and P8 (parking garages A and B) with 5,127 parking spaces in total. 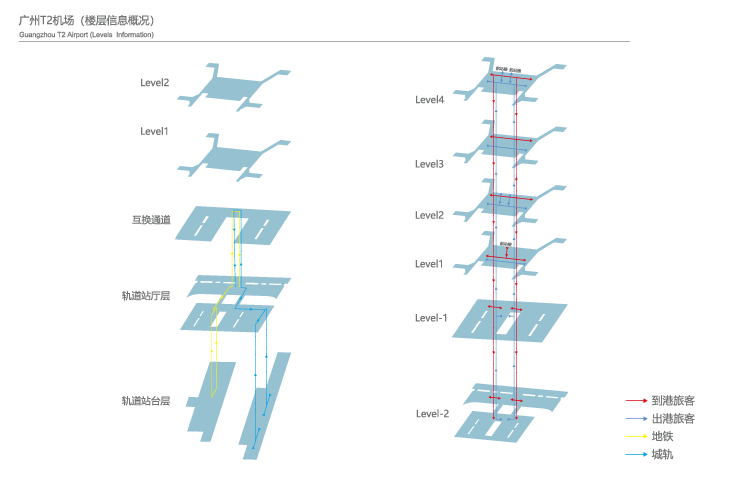 The parking garages are in the south of the main building of T2, two stories underground and three stories aboveground. 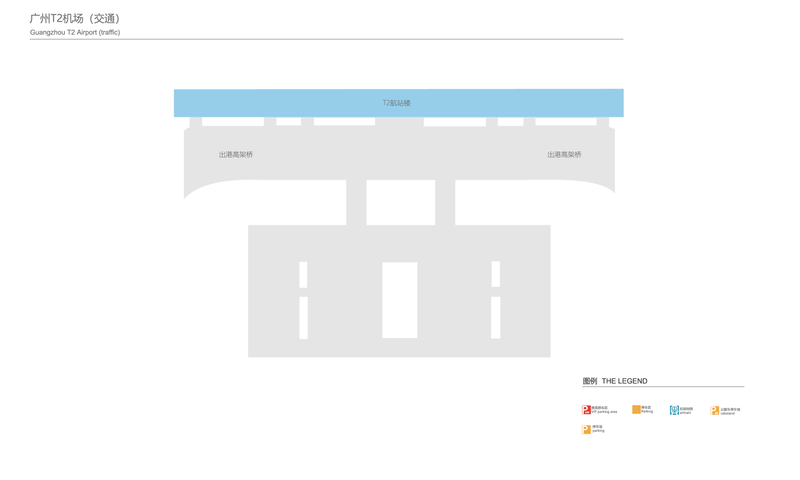 Parking in Terminal 2 is charged at the same rates as parking in Terminal 1. Parking is free for the first 15 minutes in both the open parking lots and the parking garages. Free parking is offered only twice within 24 hours. Note: An hourly rate will be charged for less than 1 hour of parking, and large motor vehicles will be charged for the number of parking spaces actually occupied. 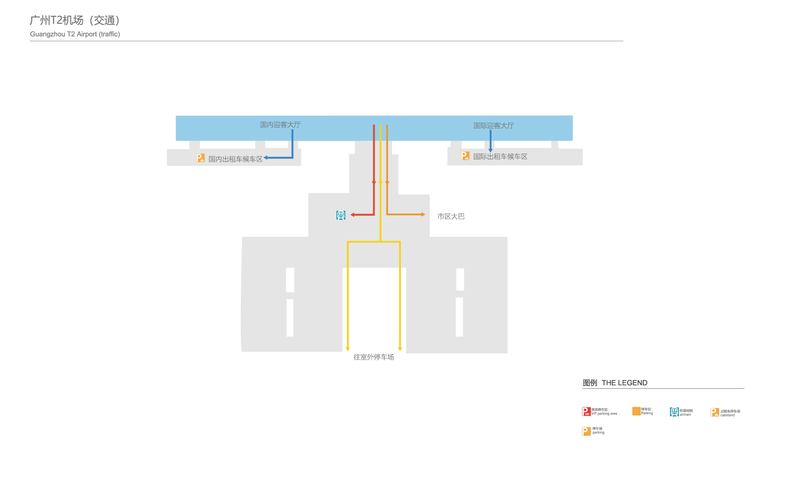 For example, RMB(10+10+5) = RMB25 will be charged for 3 hours of parking, and RMB(10×2+5×8) = RMB60 will be charged for a day of parking.RMB(60+60) = RMB120 will be charged for two days of parking. The terminal has four floors in total. 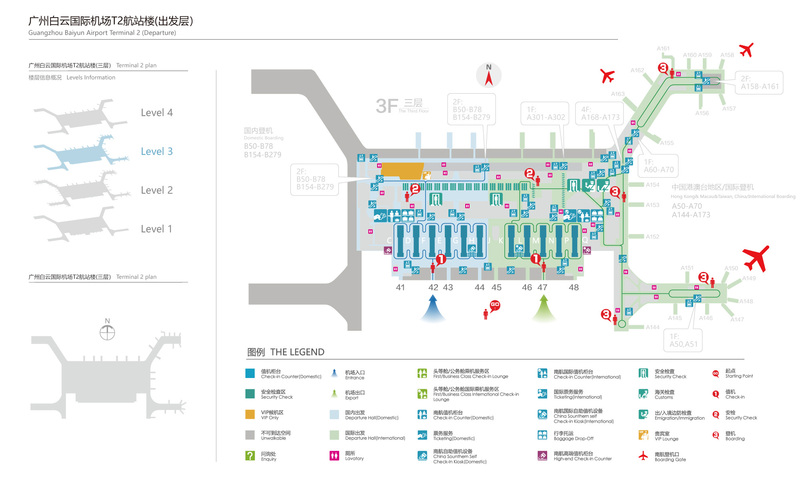 The first floor is the baggage pickup area with a total of 21 baggage carousels (31 - 51), of which there are 11 (31 - 41) for domestic passengers and 10 (42 - 51) for international passengers. The second floor is for mixed-flow domestic departures and arrivals, international arrivals and transfers. 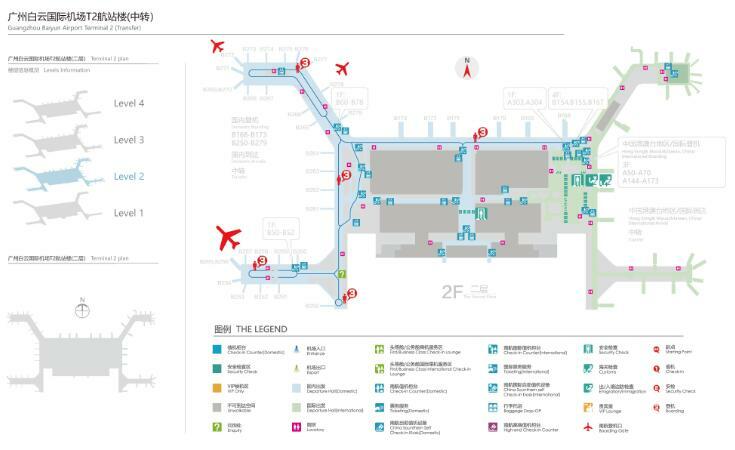 West 5, West 6, West corridor and North airside concourse are the domestic departure and arrival mixed-flow areas. 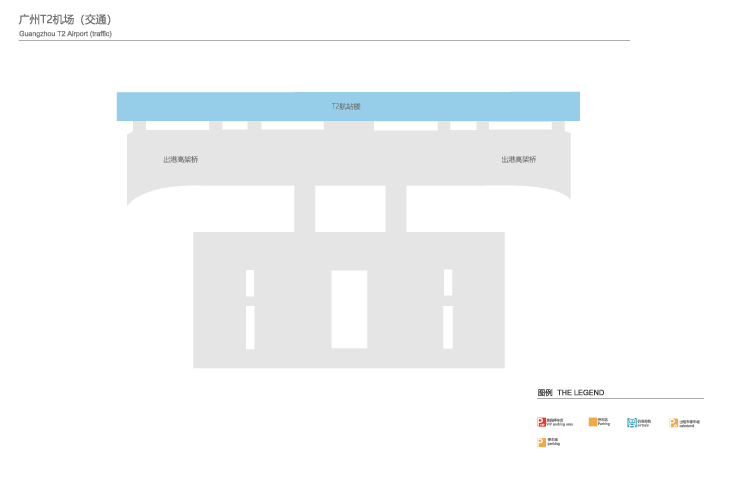 East 5, East 6 and East corridor are for international arrivals and the East 6 end is the rest area for international departures. The middle cross-shaped aisle is for arrivals and transfers. Outside the quarantine area on the third floor is the domestic and international check-in hall. 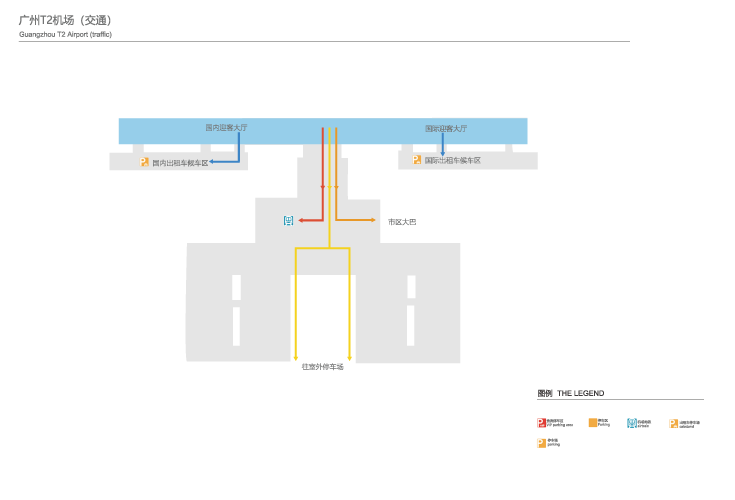 East 5, East 6 and East corridor in the isolation area are for international departures, and the North airside concourse is for international arrivals. The North airside concourse on the fourth floor is for international departures. 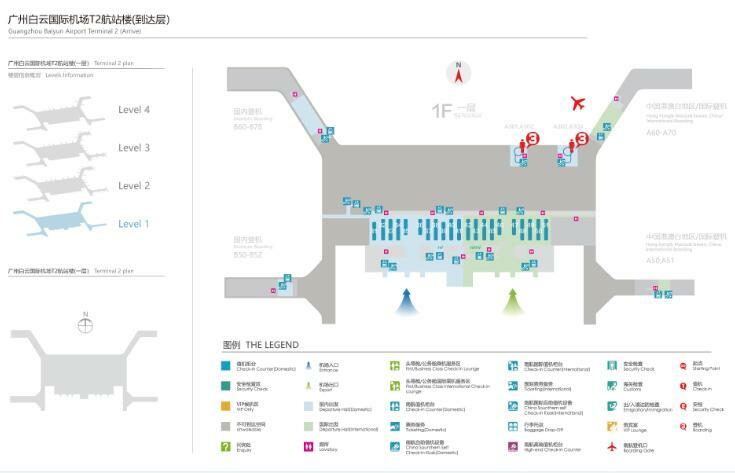 The East 6 airside concourse is the domestic departures and arrivals area, with first-class and business-class lounges and airport hourly hotels. There are a total of 13 check-in areas, of which 7 are domestic check-in areas (C - J) and 6 are international check-in areas (K - Q). Areas H and L are the self-service baggage check-in areas. Each check-in area is equipped with 28 check-in counters, 4 function counters, and 2 package inspection rooms (at the end of the area). There are at most 20 self-service check-in kiosks in (the middle of the entrance of) each check-in area. T2 airside concourses follow T1's design. 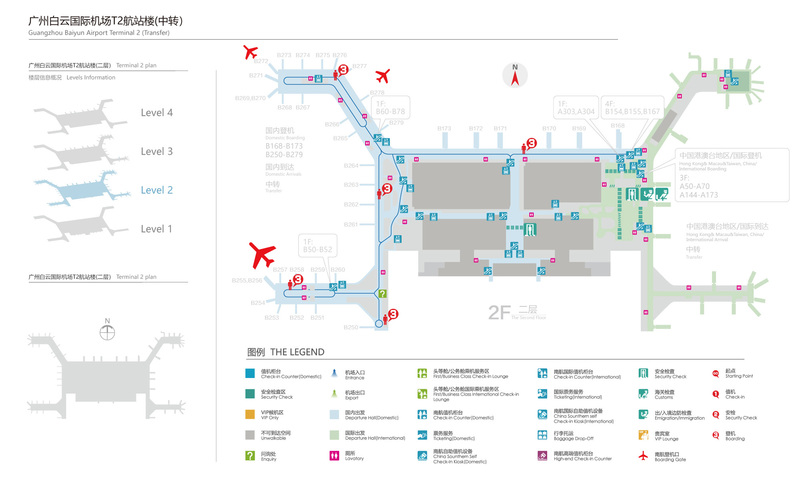 The West airside concourse is used for domestic flights, the East airside concourse is used for international flights, and the North airside concourse is for parking for both domestic or international flights.